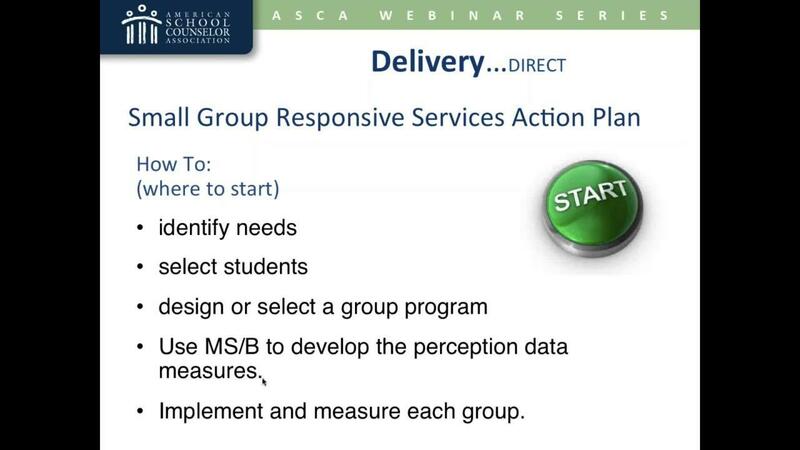 The delivery component of the ASCA National Model includes both direct (school counseling core curriculum, individual student planning and responsive services) and indirect services. Focus on how school counselors understand, organize and prioritize their services to students. Address definitions and explanations of each type of service delivery, selecting and scheduling services based on school needs, employing quality strategies for implementation and planning for assessments. Learn to complete action plans and results reports for school counseling core curriculum, closing-the-gap, and small-group responsive services. Download accompanying handouts. Link school needs identified in data to appropriate delivery methods. Karen Griffith, Ph.D., is a retired school counselor, assistant professor at the University of Georgia, lead RAMP reviewer and ASCA National Model trainer. Mark Kuranz worked for 34 years as a teacher and school counselor at J.I. Case High School in Racine, Wis., and is currently an adjunct faculty member at Marquette University in Milwaukee, Wis. He is an ASCA past president and an ASCA National Model and RAMP trainer. In 2004, ASCA awarded him the Mary E. Gehrke Lifetime Achievement Award.